Which challenges exist for creating a good MMORPG Itemization Concept? Which problems do the Game-Designers need to handle? We’d like to show you how we’ve solved those problems at Pentaquin! I’m Zanryu, System-Designer from Pentaquin, and I work on the conception of in-game-systems, like combat, balancing and crafting. Additionally, I contribute to the lore and other section. In today’s blog, I’d like to talk a little bit about our design of Pentaquin’s items, their attributes and our thoughts behind the process. To begin with, I’d like to refer to two more known examples where we often look at: World of Warcraft and Guild Wars 2. When you look at their items you can see very distinct characteristics. But the biggest difference is the fact, that the item-progression in World of Warcraft changes constantly. After each major content-update the heretofore best items are no longer the best and can be replaced completely by newer items. This methodology requires a high replay value, continuous updates and care. For older, established games this can make sense, especially if you consider the financing of said game. But it is fairly unsuitable for indie-games. On the other hand, Guild Wars 2 bets on the fact that the character can still compete with other, more active players. Even after an update or a whole expansion. The old gear won’t be devalued and retains its combat power. A huge advantage is the fact, that players won’t feel left behind, despite a potential break. However they may end up perfecting their character too soon, if not addressed correctly by the designers. Thus we decided for a system which combines the benefits of both examples. Every piece of gear consists of their respective item and, depending on their rarity, up to 3 socket slots. 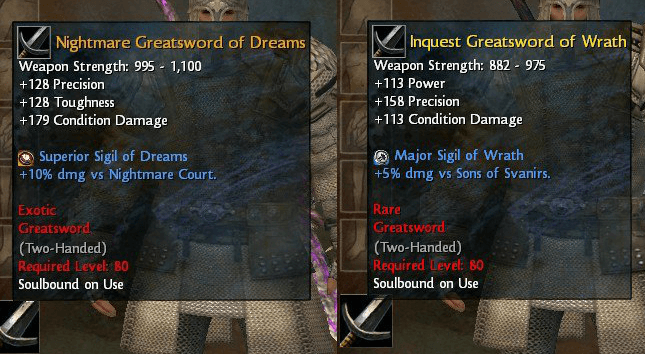 The gear-items inherit the defensive attributes and are only obtainable through crafting. The sockets can hold up to 3 offensive attributes and drop with random modifiers which have a constant value, also depending on their rarity. Concept: One of Pentaquin’s items with two out of three sockets filled. This differentiation of the layout between offensive and defensive attributes on items and sockets is important. The players shouldn’t have any freedom on how much damage they can receive before dying. 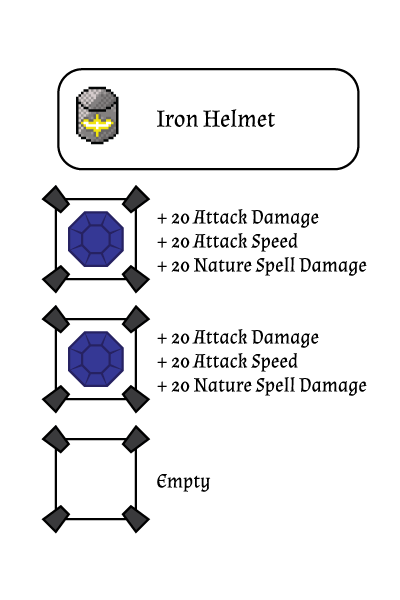 This seems to be negative, but eases the balancing of the attributes and all combat encounters. Additionally even offensive attributes can contribute to defensive abilities, just like in newer World of Warcraft expansions. Thus the decision which abilities to use is more important for your defensive values. In a scenario where he has the maximum health of 20.000 this damage is but a fraction of his total health, thus reducing the significance to almost nothing. For example, a character is supposed to have at least 10.000 health points in the end-game. Thus we have to find some sort of moderation in which we and the player can work. They have to meaningfully question themselves whether they want to deal more damage to their opponent or want to survive more damage. If you give the players the capabilities to increase their maximum health points by up to +100% then the game-designer has to think about the baselines for boss fights. If the boss deals 9.999 damage points with an area ability, most of the characters will survive. But even if it would deal 1 more damage point, characters with the minimum health of 10.000 will die instantly without the possibilities to do anything against it during combat. Against such an encounter you require that the players a) have to know the fight and b) forcibly increase their health beforehand. In games with so-called Power-Creep this is a proper technique to induce a „Gear-Check“, which prevent weak characters to kill said boss. However in games without such a Power-Creep, like Pentaquin, this method is badly applicable. The afore mentioned example describes the scenario from a perspective of a damage dealer. Tanks receive boni and mali depending on their choice of abilities which they have chosen. This changes their significance in terms of balancing. We think that an item-system with an offensive item-system design is the best to go for. Players and designer alike have less to think about while maintain the maximum amount of freedom in the players choice of their attributes. Ich bin Zanryu, System-Designer bei Pentaquin, und bin neben der Konzeption der In-Game-Systeme, wie Kampfsystem, Balancing und Crafting, auch in anderen Bereichen wie Lore-Konzeption tätig.